This bundle is going to give you a ton of vape juice for you to indulge in whenever you want. 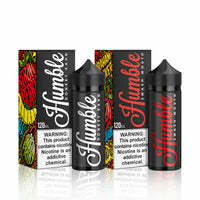 Humble E Liquid is a popular brand that has been creating delicious e liquid for a long time, and this bundle will give you two of their best flavors for you to try. This bundle is going to include Donkey Kahn and Smash Mouth, both delicious flavors and part of the Humble E Liquid collection. They are going to come in 120ml bottles, which means you will have a total of 240ml of e liquid to try for a long time before it is all completely gone. This bundle is going to be available at the affordable price of $19.99! This is an incredible deal that is certainly not going to last a long time, so act now before you miss your opportunity to vape with two flavorful blends. Which one are you excited to try out first? Humble E Liquid Bundle - Humble E Liquid has a rating of 4.8 stars based on 28 reviews.